Gaaaaaaaaaah, school starts tomorrow. Dummbbb. My classes this semester don't look too great, but I'll push through it. And I'll be trying Nano again in November, so that's something to...er...look forward to. I've been busy making the best out of the end of summer. I managed to do quite a bit this summer, even if I didn't get a job yet. I've been drawing more, and I think I've gotten much better than I was last summer. I at least have some experience with color now, which is something I've always wanted. I also made at least three comics! Well, I worked on three comics. I haven't finished all of them. I got a juror summons last week, and had to send in my school information to get it postponed. I also got an overlay for a large hole in one of my back teeth, but it's very fragile, so I can't chew on hard things with that side of my fffface anymore. Scrubs is coming to Comedy Central. That is cah-ray-zee. 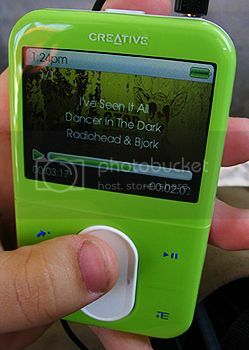 Also, NEW MP3 PLAYER!! Yaaaaaaay! I love it a looottt. Ever since my iPod broke (and the replacements broke), I've been rather musicless outside of the computer and car, so I finally decided to get a Zen Vision:M. It's so awesome! It's 30GB, stores pictures and videos, and has an FM radio built in. Isn't she beautiful?? Ignore my freakishly shaped thumb, pls. School is for fools and tools. All the things that you have said here are bursting with truth, and sauce. Yesss I have a Creative Zen Micro and I love it too. The display on the Vision:M looks awesome. It is quite bright and clear! The picture quality is amazing. I love it! Sorry you had to give up on the iPod (I'm still lovin' mine). I likes the new one though. I hadn't even noticed your thumb until you mentioned it. Now it's all I can see!!! If I had a smaller music collection, I might've tried for one of the cheaper iPods. I'd heard good things about Zen, though. Hahaa. My thumb is scary! It scares me, anyways. Not as scary as Tery's....she chews on them as a nervous habit and they look exactly like raw, unpeeled carrots. Ew. D0000000d! No way! That's the player I just bought - it arrived in the mail yesterday. Yeah - I bought a Kroo case that came with a little plastic screen protector. THUMB! try drawing a happy face on it, then it might not offend.